Eureka! I only have a few of these moments a year, and I am ecstatic to share it with you today!! Remember last year when I shared my Ruffle Ribbon Christmas Trees with you? That was kind of one of these moments, but that involved a bit of handy work with tools and, they were no 99¢!! Yes, you read right 99¢!! 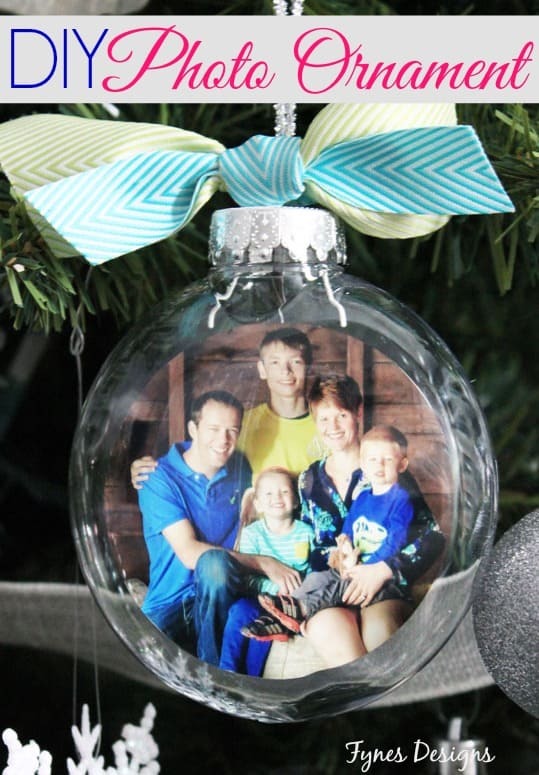 The 2013 edition of the DIY Christmas Tree is crazy simple! You seen right- KITCHEN FUNNELS! Available at every dollar store on earth! Stack them and viola a tree! To stabilize these DIY Christmas tree cones I pushed a small styrofoam ball over the tip and hot glued the next smallest on top! If you shop around (which I scoured every cheap store around) you’ll find a few different shapes and sizes of funnels. If you want to give the base of your tree a little lift just spray paint an empty ribbon spool! I knew I was saving them for something! I used May Arts Ribbon in some of my favourite burlap, and cottons, but there are loads of ideas for decorating them. You could use beads, fabric or felt, foam, feathers, even pinecones! I know you’ll come up with something creative to do with your DIY Christmas Tree. Snap a shot to share with me on instagram, or link up to Facebook! Plus you’ll get the first peek of the other great Holiday treats I have in store for you! One last look… I know you weren’t finished! May all your holiday happiness show in your crafts this season! I love those! Must get some of that ribbon! Fantastic idea!! I can’t get over how expensive cones are at craft stores. I won’t even get into wreath molds but the pool noodle solved that one. I saw the pool noodle trick, but didn’t like the diameter. You can get 6′ of pipe insulation from the plumbing department at Lowes for around $2. It is scored, so I made sure that was on the inside. Three pieces of duct tape and $1 of tulle and I saved myself $9. What a great idea! 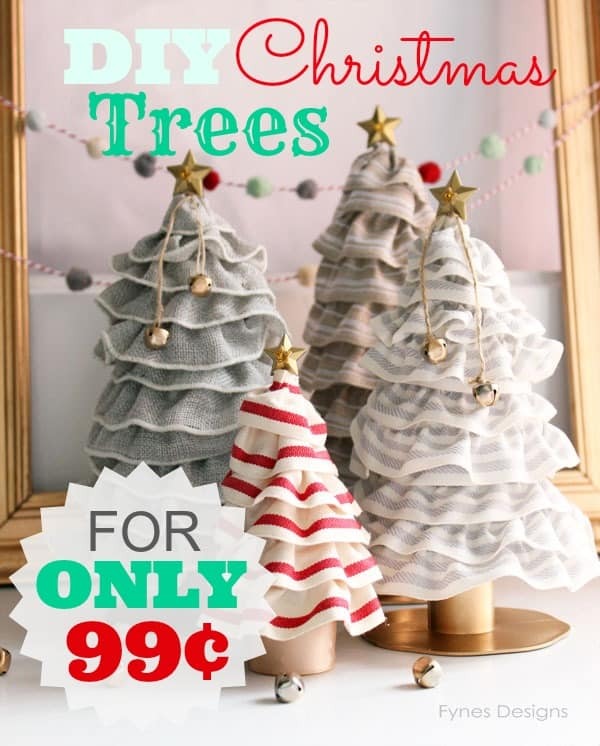 Cheap, and they are way cuter than most trees out there! Oh my gosh, what a brilliant idea. They look super classy too. I don’t have any of the ribbon spools, but I have seen spools available at the Dollar Store, so that’s a PLUS. I haven’t seen any funnels though, so I’ll have to take a closer look. Thanks Hollie, The little stars are something I had in my scrapbooking stash. They are Jolees boutique. Maybe you could find something similar at Michaels. Funnels are something you never see until you have a reason to look for them! These are adorable! Pinning until I round up so e funnels and find the perfect way to decorate them! My local Dollar Tree carried a bundle of funnels ( 6) for a DOLLAR ! I am going to make a whole forest of these sweet little trees. I am using various burlap pieces that I already have and some ticking. Thank you for sharing this with us ! Thats great news! I’m SO glad you can use the idea, 6 for 1$ is an amazing funnel deal, lucky lady! I am so in love with this, I can’t even tell you!!! 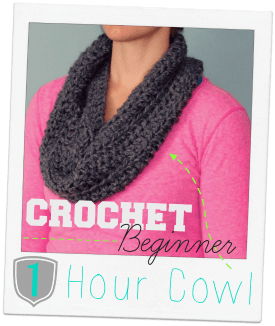 It looks straight out of Pottery Barn, yet so easy to make! I will definitely be making these this holiday season! Thanks Christina! I’d love to see yours when your done, link them up to FB! Oh, how cute! My name is Katie and I host Fall Into the Holidays, now open. All entries get pinned. I would love to have you link up! This week’s round is still open! You’re brilliant! I would have never considered funnels! Amazing idea! They are beautiful and definitely on my to do list this week! I think these turned out better than the ones you did last year! Not to say that those ones weren’t nice as well. Thanks Susanna, I do too! So easy, and cheap!! What a FABULOUS idea Virginia!! Genius!! They turned out sooooo cute!!!! I LOVE this idea! I have pinned it to my “children” Pinterest board, too. I am always on the lookout for crafts for kiddos! Very, very pretty. I would never thought of funnels. Would you like to share it at Foodies & Crafties Soirée http://goo.gl/lfsJGS? Is the ribbon hot-glued on? Is it all one piece wrapped around, or is each layer separate? 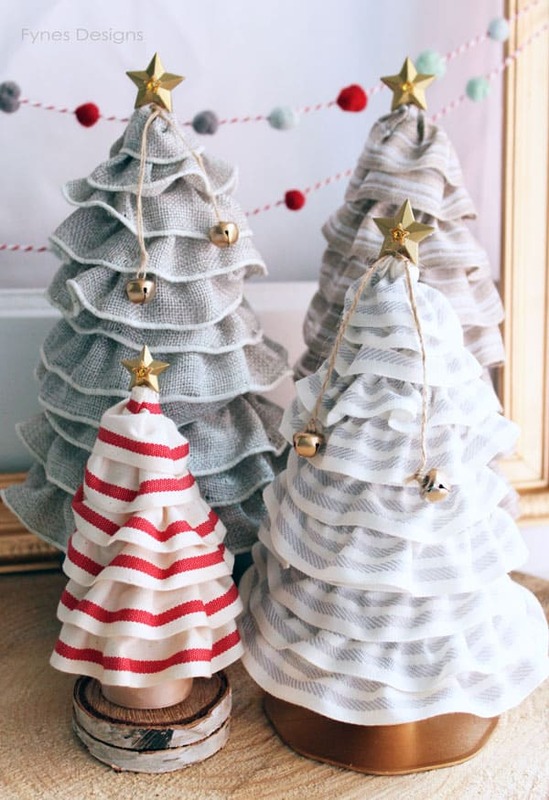 Hi Virginia, today I am going to do some Christmas crafting and lots of your recent ideas are on my list to do 🙂 For these trees did you sew the ribbon first to make it ruffled or just ruffle it with the glue? Thanks for all the awesome inspiration – love your ideas!! So happy to hear Jenny! I just ran a line of glue onto the funnel, laid the ribbon on the glue and pinched it into pleats. Only squirt about a 2″line of glue though because you have to work quickly once you put the ribbon on. Good luck, happy crafting! What an awesome idea! How much in total would it be to create this? Less than $5.00? I love doing arts and crafts. For sure less than 5! Especially if you used fabric scraps rather than ribbon! Thanks, I haven’t done a tutorial yet, it was the first I tried. Martha Stewart has a great tutorial for creating felted balls, then I simply stung them with bakers twine! Thanks for stopping by! 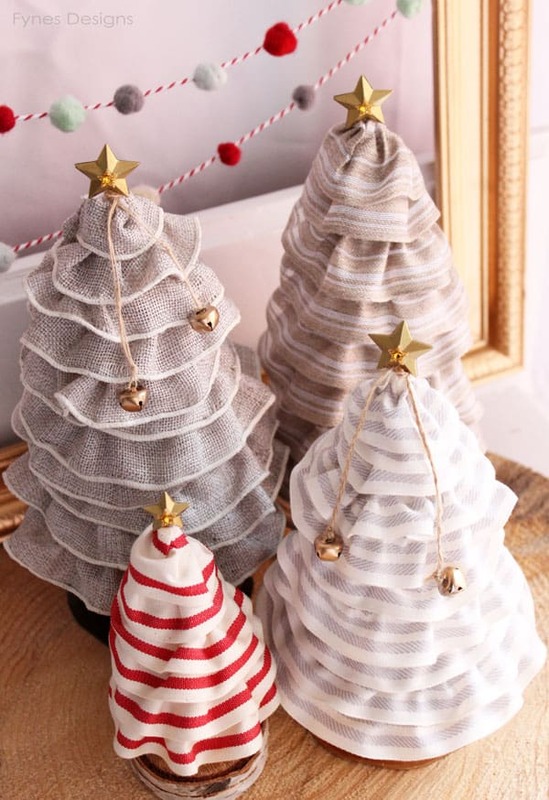 Oh-My-Gosh are these not the cutest trees I have seen, “with funnels” ? How fun is this!!! You have some really cute and clever ideas, Im in love! Thanks for stopping by, I’m gald you found some ideas that caught your eye! What an awesome idea. 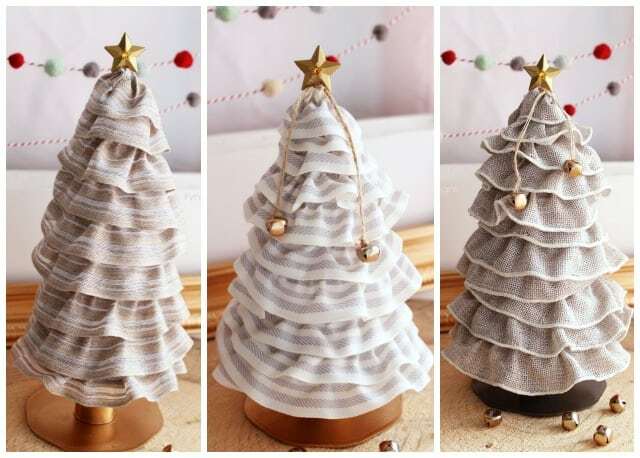 I have a few questions, I’m planning to make and use these cute little trees as centerpieces. How did you secure the cones atop one another? Did you only use a hot clue gun? I’m a little blond so I need the details, as I am more of a visual learning. Also, how much ribbon did you use? Which is better ribbon or fabric? THANKS! I put a Styrofoam ball on top of each funnel, then used hot glue to adhere them together. fabric and ribbon will both give you different looks. Good luck! What is the material actually? Ribbon gathered by sewing machine? I must have missed something? its just ribbon that is bunched while you’re gluing it down, just make pleats as you go.